Home » Posts tagged "RAMPS"
Coming to Appalachia! Scaling up the Resistance: Strategies and Stories from the German Climate Justice Movement! Join members of the German direct action collective Ende Gelände on their US tour as they share stories and tactics with local groups about successful mass mobilizations for climate justice. Their group, whose name means “Here and No Further” is founded on principles of frontline struggles, mass mobilization, direct action, and cooperation across organizational and tactical differences. They have managed to pull off mass actions of amazing scale: last fall, 6,000 people collectively blocked coal infrastructure together! Wearing their emblematic white overalls, demonstrators invaded mining pits, danced in front of the diggers, slept on the railways, and provoked pictures that have raised attention globally and made the connections between climate chaos and capitalism. Come hear about the growing, diverse and radical climate justice movement in Germany, and hear ways we can link our resistance locally to this international uprising. There are multiple events in Appalachia to choose from! Graphic by Adam Peck via Think Progress. In January, thousands of gallons of the toxic coal cleaning chemicals contaminated the drinking supply for 300,000 people and hundreds of inmates at the South Central Regional Jail (SCRJ) in Charleston, WV, were deprived of access to enough safe water. Many inmates suffered from illness and injury from dehydration or chemical exposure. Some even faced violence and legal repercussions for seeking medical help and for asking for clean water to drink. You can hold SCRJ accountable and ensure the basic human rights for inmates if you speak out right now! Click here to demand basic human rights and safe water access for inmates at West Virginia’s South Central Regional Jail. Our allies with West Virginia Water Hub and Radical Action for Mountain People’s Survival (RAMPS) met and corresponded with more than 50 inmates, and based on their stories, it’s clear that this failed crisis response is just the latest example in a larger pattern of abuse, violence, and negligence by the jail’s staff and administration. WV Water Hub and RAMPS are amplifying the voices of inmates and exposing this horrendous abuse in order to force a response from prison authorities. Add your voice: sign RAMPS’ petition to demand basic human rights for inmates in coal country. RAMPS has stated that they are acting “in solidarity with broader movements of resistance to the growing prison state and poisonous extractive industries.” Combined, the systems of state repression and fossil fuel industry profit are creating a perpetual crisis. Like RAMPS, our movements must respond in kind and directly confront fossil fuel expansion, challenge the political power of that system, and act in solidarity with those facing the brunt of the crisis. Junior Walk, of West Virginia. Walk lives in the Coal River Valley, directly below Alpha operations on Coal River Mountain. Alpha recently began blasting on the 264 acre Collins Fork mine. Local residents and activists have opposed surface mining on Coal River Mountain since the late 1990s. “I am here today to demand an end to Alpha’s role in the destruction of Appalachia. While coal is exported and profits leave the region, the health effects remain in the communities,” said Camilo Pereira, one of the protestors blocking the office. Two of the protesters in a lockbox at the front door of Alpha’s headquarters and blocked the entrance. More than 20 peer-reviewed studies demonstrate a connection between mountaintop removal coal mining operations and increased cases of lung and heart diseases, as well as increased birth defects, early mortality, and depression. The RAMPS Campaign’s ongoing work against Alpha Natural Resources demands an end to Alpha’s mountaintop removal practices in Appalachia. Furthermore, RAMPS urges the company to re-employ miners for effective and thorough reclamation of retired and abandoned mine sites. Photos of today’s protest can be found here when available. Mountain Justice is a regional and national network that has worked for 10 years to support community based, grassroots efforts to end Mountaintop Removal and build a brighter future in Appalachia. ST. LOUIS–Today, for the second time in less than a week, activists were arrested at a Peabody Coal demonstration. 75 people rallied at Peabody’s annual shareholder meeting at the Ritz Carlton in Clayton. Members of the local Take Back St. Louis campaign were joined by Dineh (Navajo) Peabody resisters from Black Mesa and residents from Rocky Branch, Illinois who are currently fighting Peabody’s mine expansion there. Representatives from Take Back St. Louis, Justice for Rocky Branch, and Tonizhoni Ani had bought shares of Peabody in order to attend the shareholder meeting and voice their concerns to CEO Greg Boyce, but were not allowed into the main meeting room with Peabody executives. When they were placed in an “overflow room,” they walked out of the meeting. The entire rally then marched to the entrance of the Ritz Carlton to deliver a letter outlining the group’s demands to Greg Boyce. Eight people were arrested while trying to enter the Ritz Carlton to deliver the letter. 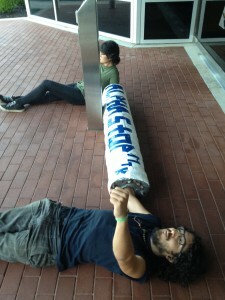 Two other people were arrested attempting to enter the shareholder meeting from the overflow room. Today’s protest comes less than a week after Wash U Students Against Peabody’s 17 day sit-in ended when seven students were arrested trying to enter their Board of Trustees meeting to encourage Peabody CEO Greg Boyce to resign from the University’s Board of Trustees. Recently, Peabody has been engaging in unprecedented attempts to undermine St. Louis’ local democracy. In late March, Peabody sued to keep the citizen-driven Take Back St. Louis initiative off the ballot and away from voters. The ballot initiative would stop the city’s policy of giving Peabody and other big corporations large tax breaks. Now, in the past few days, Peabody’s lobbyists and Mayor Slay’s lobbyists have inserted amendments into Missouri Senate Bill 672 that would ban the city of St. Louis from “by ballot measure impos[ing] any restriction on any public financial incentive authorized by statute.” The amendment is a blow to local control, stripping the city of the ability to determine its own tax regulation. Today’s demonstration united the local Take Back St. Louis campaign with communities fighting Peabody across the nation, including Dineh (Navajo) resistors from Big Mountain/Black Mesa in Arizona, and the Justice for Rocky Branch campaign in Southern Illinois. For decades, these communities have experienced Peabody using its financial power to influence democracy and ensure continued profits without concern for human lives, homes, and futures. This year marks the 40th year of Indigenous resistance by the Diné (Navajo) communities of Big Mountain and Black Mesa, Arizona to forced relocation from ancestral homelands due to Peabody Coal’s massive strip mining. The effects of the relocation meet all the criteria of the UN’s internationally recognized definition of cultural genocide. Diné (Navajo) resistors on Black Mesa are planning a one-week training camp starting May 16th to demand “not one more relocation” of Indigenous people by Peabody. Members of the Take Back St. Louis campaign will be traveling to Black Mesa for the camp, continuing the increased unity amongst groups fighting Peabody across the country. Photos are attached. Video available upon request. Activists are available for interviews all day.